The response to intervention (RTI) service delivery model has been incorporated into elementary schools throughout the United States. This multi-tiered model has been found to assist struggling students in all academic areas through the use of research-based instructional strategies. Because of its success at the elementary level, more and more secondary education institutions are turning to RTI as a viable model that can help students achieve academic success. 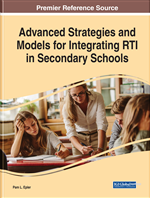 This chapter provides a history of how the RTI model was established in American elementary schools as well as an overview of how it can be implemented into the secondary educational environment. The chapter also describes the components required for successful implementation along with challenges facing middle and high schools when using the model. This type of service delivery model is a new way of teaching within the secondary educational arena but has been shown to be extremely effective if implemented correctly. Closing the achievement gap among all students has been a struggle that has long concerned educators. Throughout the history of education, various forms of instructional strategies have been applied; some have been successful, and some have not. However, despite teachers’ best efforts, the achievement gap continues to exist, and in some cases has increased, because no one teaching method fits the needs of all students. The Response to Intervention (RTI) service delivery model appears to be the answer to all educators’ prayers. It allows struggling students to start at their achievement level and, through a process of various instructional strategies and data collection, increase their academic success (All Kinds of Minds, 2008; Brown-Chidsey, 2007; Canter, Klotz, & Cowan, 2008; Cummings, Atkins, Allison, & Cole, 2008; Duffy, 2007). The National Center on Response to Intervention (2010) defined RTI as a service delivery model that integrates assessment and intervention within a multilevel prevention system to maximize student achievement and reduce behavior problems. With RTI, schools identify students at risk for poor learning outcomes, monitor student progress, provide evidence-based interventions and adjust the intensity and nature of those interventions depending on a student’s responsiveness, and identify students with learning disabilities or other disabilities. This service delivery model has had a powerful impact on the academic achievement of students across the United States (All Kinds of Minds, 2008; Brown-Chidsey, 2007; Canter et al., 2008; Cummings et al., 2008; Duffy, 2007). Although RTI has been available for school districts to use for more than 30 years under such names as “Teacher Assistance Team Model, Pre-Referral Intervention Model, Mainstream Assistance Team Model, School-Based Consultation Team Model, and Problem-Solving Model” (All Kinds of Minds, 2008, p. 1), it was not until the reauthorization of the federally legislated Individuals with Disabilities Education Act (IDEA) in 2004 that school districts acknowledged this model as an alternative method to identify students with learning disabilities. According to the Center for Comprehensive School Reform and Improvement (2008), RTI has since gone beyond being used only as an identifier for special education services and “has become a comprehensive, data-based prevention model for helping struggling students achieve” (p. 1). Through the use of this service delivery model, teachers can identify any learning difficulties and make necessary modifications to the curricula while the student is still in the regular classroom. As a result, the RTI model has led to decreased referrals to special education programs (Brown-Chidsey, 2007; Canter et al., 2008; Cummings et al., 2008; Duffy, 2007). Furthermore, according to Woodruff (2011) and Hosp (2010), disproportionality, meaning the number of students who are overrepresented in special education (such as students living below the poverty line or students whose first language is not English), has been reduced through the implementation of RTI. Although it has been an important element within the educational realm for both academic and behavioral purposes, RTI has been used much more frequently in the elementary school environment, and there are many studies that show its successful implementation (e.g., Johnson & Smith, 2008). In 2009 and 2010, Spectrum K12 School Solutions conducted the RTI Adoption Survey, of which one goal was to assess how widely the Response to Intervention service delivery model has been adopted in U.S. school districts (Spectrum K12 School Solutions, 2009, 2010). Table 1 displays implementation-related findings from 2009 and 2010, showing the percentage rates of usage at the elementary, middle, and high school levels in reading, math, and behavior. Discrepancy: Difference between a student’s IQ and his/her score on an achievement test. A discrepancy model was the traditional way to determine if a student qualified for a specific learning disability under IDEA. Although some states may still use this method of identifying a student for special education services, it can no longer be the sole determinant. Multi-Tiered Model: Multiple tiers within the RTI service delivery model, in which struggling students move from one tier to the next, and each tier provides more intensive interventions through the use of differentiated instruction. Fidelity: Using a tool or intervention the exact way it is meant to be used. Using it in any fashion other than what is intended can cause progress-monitoring data to be skewed. Progress Monitoring: Charting student progress at least weekly to ensure that a specific intervention is working. An intervention should be monitored approximately 4-6 weeks and then re-evaluated. If the student is making progress, the intervention should continue. If no progress is being made, a new intervention should be tried. Research-Based (or Scientifically Based) Instruction: Strategies that have been tested through research to assist students with academic success. Response to Intervention (RTI): A service delivery model that provides research-based instructional strategies to struggling students. The purpose of RTI is to identify students when they are first struggling and provide interventions so that academic and behavioral success will be established immediately. Secondary Education: Includes Grades 6 through 12. Problem-solving Approach: Involves brainstorming within a team to determine the best research-based intervention to use for a particular student. Standard-protocol Approach: Uses already established interventions within each tier level. The same interventions are used with every student within the same tier.